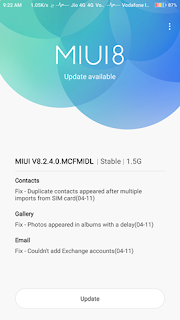 Xiaomi has started rolling out MIUI V8.2.4.0 MCFMIDL Update for Redmi Note 4 in India 1.5GB. which fix bugs still no Nougat Update yet. 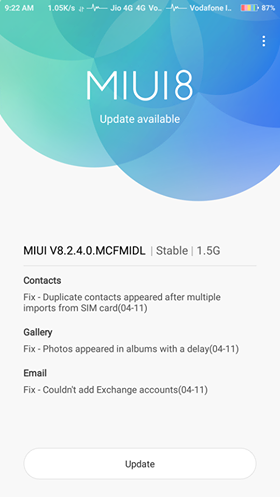 Fix Duplicate contacts Appeared after multiple imports from sim card. Xiaomi Redmi Note 4 has a Metal body It features a 5.5-inch (1920 x 1080 pixels) Full HD Display with 2.5D curved glass powered by a 2.0 GHz Qualcomm (MSM8953) Octa- Core processor with Adreno 506 GPU It comes with a 2GB/3GB/4GB RAM with 32GB/64GB of internal storage. It has a Hybrid Slim slot. Which means you can use one Micro Sim + Nano Sim or One Micro Sim + Micro Sd card. Xiaomi Redmi Note 4 has a Fingerprint Scanner on Rear which also helps to capture Photos and IR Blaster on Top.